Amid all ancient religions, Buddhism gets notable esteem and respect from people all over the world especially in South Asia, East Asia and Southeast Asia. With the moral principle based on the belief of Kama resembling to scientific principles, everyone praises the Lord Buddha who established and disseminated these principles. In Buddhism, there are three main Buddhist celebrations: Makabucha (February), Asalhabucha (July), and Visakabucha which will soon happen on May 19th of this year. 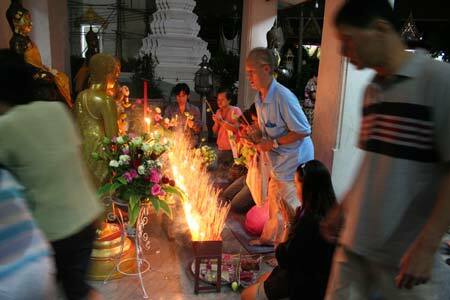 Visakabucha day usually falls on a particular date in May or June according to Thai lunar calendar. The word Visakabucha stands for Visakapoonnameebucha which implies the worship of his Lord Buddha in the middle of the 6th lunar month. Buddhist regard this day as the Lord Buddha’s recalling Day. There occur three incidents related to his Lord Buddha’s life on Visakabucha including his birthday (80 B.C), the enlightenment day (35 B.C. ), and the Nirvana day (1 B.C.). Influenced by Sri Lanka where the King commemorated magnificent Visakabucha ceremony, the ceremony also happened in Thailand during the Sukhothai period because of religious connection between the two countries. However, no evidence of the activity was found during Thonburi and early Ratanakosin period, but in the reign of King Rama II, the ceremony was once again rearranged. Common activities Buddhist do today fall on merit making: offering food to priest in morning time; behaving themselves according to Buddhism’s Five Percepts, etc. Some of them make a visit to temple to attend the sermon or practice the meditation while some set birds and fish free. 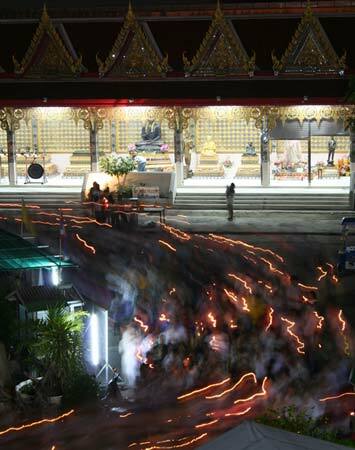 And after sunset, the candle lit procession is usually done clockwise around each temple’s church. On this occasion, a grand religious ceremony is also held at Phuttha Monthon in Nakhon Pathom Province where the statue of the Walking Buddha is located. Here the candle lit procession is usually led by a royal family member. Buddhists from nearby and other provinces can come to take part in the procession. Above all and in conclusion, the most significant and main aim of all the activities in Visakabucha is for mind purification hence the Buddhist can live their lives peacefully.